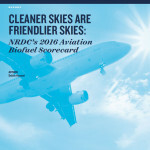 Low carbon fuels, or clean fuels, are those that result in less carbon pollution compared to petroleum-based fuels and that are produced in a sustainable manner. Also called next generation or advanced biofuels, they can overcome the limitations of both fossil fuels and first generation predecessors by utilizing existing infrastructure, reducing emissions, and careful use of our land when coupled with proper sustainability certification. Advanced biofuels can be considered “low carbon” or “clean fuels” by looking at the total impact of the fuel on the environment and economy. These fuels can provide significant environmental and social benefits if developed with caution and foresight. The best biofuels are those that make it environmentally and economically possible to produce more food and fuel and do it in a way that clearly reduces global warming pollution, conserves and enhances our soil and water resources, protects our fragile wild lands, forests and native ecosystems, and improves the economic welfare of farmers, workers and communities. Fortunately, there are third party tools to help producers and buyers assess and validate the sustainability of their biofuels. Credible certification systems such as the Roundtable on Sustainable Biofuels (RSB) verify those products that come from supply chains that deliver on the environmental promise of advanced biofuels and avoid significant unintended consequences. This website provides the economic and environmental case for transitioning to next generation, or advanced biofuels by profiling the advanced biofuel industry. How is a fuel’s impact determined? Lifecycle accounting allows us to rate fuels based on all the greenhouse gas emissions produced from creation or extraction to the use in a vehicle, including supply chain emissions. 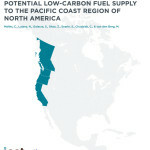 Regions throughout the world, including California, the U.S. federal government, and the European Union all rate fuel GHG emissions based on this scoring approach. 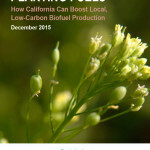 Land use is an important part of biofuel production, as feedstocks are frequently sourced from biomass. The inclusion of land use change impacts help to minimize the use of biomass such as forests as well as sources that compete with food production. 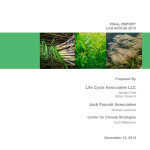 What feedstocks are used for advanced biofuels? One of the advantages of advanced biofuels is the diversity of feedstock alternatives. Advanced biofuels may be sourced from: agricultural waste or residue, waste oils, perennial grasses and other dedicated energy crops, algae, waste biomass, farmed woody biomass, post-recycled waste and many others. Each clean fuel company has its own proprietary process to convert a feedstock into a fuel. 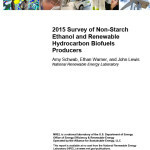 Companies producing ethanol, an alcohol based fuel, may use a process similar to alcohol distillation. Other companies producing jet fuel or diesel substitutes may gasify feedstocks into their basic chemical building blocks, and re-build the chemical components so the result is a hydrocarbon chain that looks like crude oil. Then traditional refining of the crude oil can produce gasoline, diesel, or jet fuel that can be used in existing pipelines, tanks and engines. Are clean fuels available today? Many companies are just beginning production of fuels or construction of facilities that will produce clean fuels. These fuels will be blended into the gasoline and diesel we use everyday, lessening the overall impact of the fuel sold in the United States. 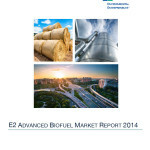 See here for more information about the advanced biofuel industry or individual biofuel companies. 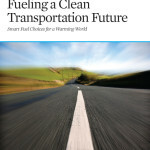 What will Clean Fuels do for our Economy? How does this help state-level economies? 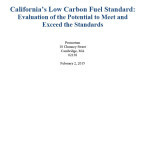 Using California as an example, consumers and businesses spent approximately $70 billion in 2012 on gasoline and diesel with over $40 billion of this being sent outside the state and overseas. Instead, investments can be made in safe, domestic, and clean energy sources like renewable fuels, electricity, and natural gas to fuel our cars and trucks. More advanced biorefineries are coming online each year. E2’s projection for jobs from advanced biofuel refineries (expected from 2014 through 2016) estimated that about 1,500 permanent, 7,000 construction and 9,900 indirect jobs could be created through the more than twenty expected refineries. These numbers only scratch the surface, as it does not fully account for other jobs created within the biofuel value chain or corporate and R&D jobs. Petroleum imports drive the United States trade deficit. The trade deficit in petroleum is at $268 billion in 2010, up from $50 billion annually in the 1990s. Petroleum’s share of total U.S. trade deficit has risen from 27 percent in 2004 to about 50 percent in 2012. As domestically produced biofuels displace oil imports, they also reduce the trade deficit.